This route begins and ends in Olathe, KS. Take K-7 north to K-10 west into Lawrence. In Lawrence pickup US24 and head west through Topeka to Manhattan. 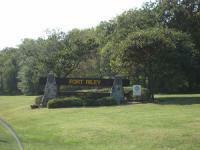 Look for Highway 18 to Ft Riley. We missed the back roads leaving Ft Riley and it was getting late so we got on I-70 and zoomed into Abilene. Everything is close and easy to find in Abilene. We headed south on 15 out of Abilene to 4. East on 4 to Herrington where we picked up US 56. US 56 is my favorite ride and leads you back into Olathe. Don't forget to stop at the Hays House in Council Grove. This was a very nice easy ride off the main highways. We made the trip in the fall. The trees were turning and harvest had begun. The Flint Hills are beautiful and there was very little traffic. This was definitely a cruiser trip. Laid back flat and very little traffic. Go as fast or slow as you want. Interstate always close if you decide to get on with it. We stopped at the state capital (Topeka), KSU (Manhattan), Lunch at the Cottage House in Belvue, KS, they wouldn't let us in Ft. Riley because we didn't have proper riding attire. I wanted to see the Calvary Museum. We stayed at the Holiday Inn Express (in Abilene) and walked to the Brookville Hotel for a wonderful fried chicken dinner. GWRRA was having a rally at the fair grounds so we met a lot of "Wingers". We spent 3 hrs at the Eisenhower center and it was nice. Left Abilene and headed southeast to Council Grove and had more fried chicken at the Hays House. This is a great trip for two ups. Lots to see and lots of places to stop. on June 25, 2010 3 out of 3 members found this review useful. Just so you know, military post require sleeves, full finger gloves, eye protection and over the ankle boots and reflective material on your person and a MIL ID or drivers license to ride a bike! I ride portions of this all the time when I only have a few hours, but the full loop would be a very nice ride. Cool stopping spots make for good break opportunities, and you don't even have to get that far out of town if you want to stay close to home. on March 31, 2010 0 out of 0 members found this review useful. sounds like a great ride,ive allways been fond of us56 my grand parents lived for 50 years in council grove,i spent many days there.I hope my wife and i will run into you and your wife sometime on a ride.